HomeCleaners and ProtectantsBixler's Elixer Elixir Inflatable Boat Protectant and Polish, 16 oz. Elixir Inflatable Boat Protectant and Polish, 16 oz. Don’t let your inflatable get sunburned!! Our exclusive polish & protectant formula restores color and shine and provides surface and UV protection. Buy 2 or more and save $1.00 each. Protect and revitalize your old Zodiac, Achilles, Avon & AB inflatable and don’t let the sun’s rays dry out and degrade your boat. Our exclusive acrylic polish & protectant formula restores color and shine and provides surface and UV protection by forming a protective shell on your inflatable. The above picture is a before and after showing the dried polish and protectant after it is applied. Bixler’s Protectant is the only UV protectant that uses a self leveling formula so it doesn’t streak. Safe for all PVC and Hypalon inflatable boats. This deep penetrating 16 oz surface protectant will also prevent oxidation and fading. It also makes clean up easier as the pores are sealed so the dirt does not penetrate. Apply two coats and wait 20 minutes between applications. Buy 2 or more and save $1.00 each. See related products below for non abrasive scrub pads and reusable microfiber cleaning cloth. 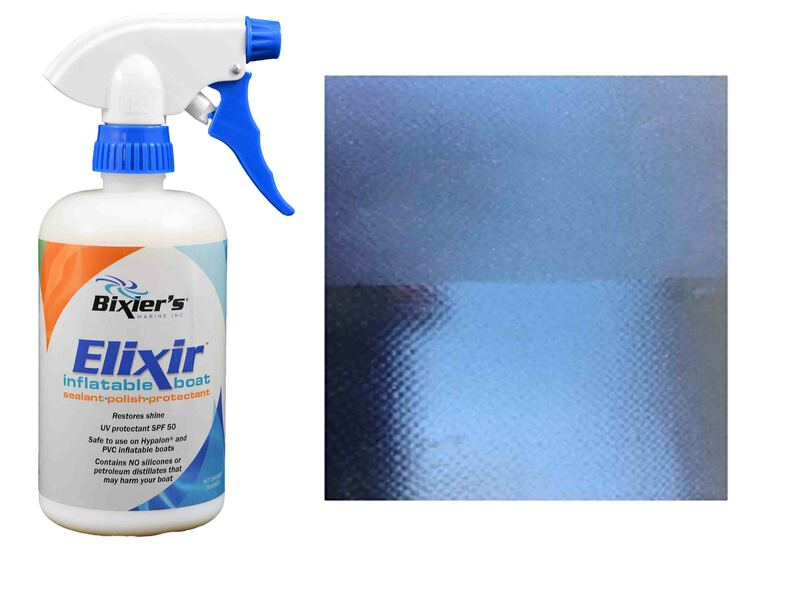 Bixler’s Elixir™ 3 Step Inflatable Boat Deep Cleaning and Restoration Kit. Non abrasive scrub pads 6" x 4.5". Quantity 3. Scrub your inflatable or fiberglass without leaving scratches. 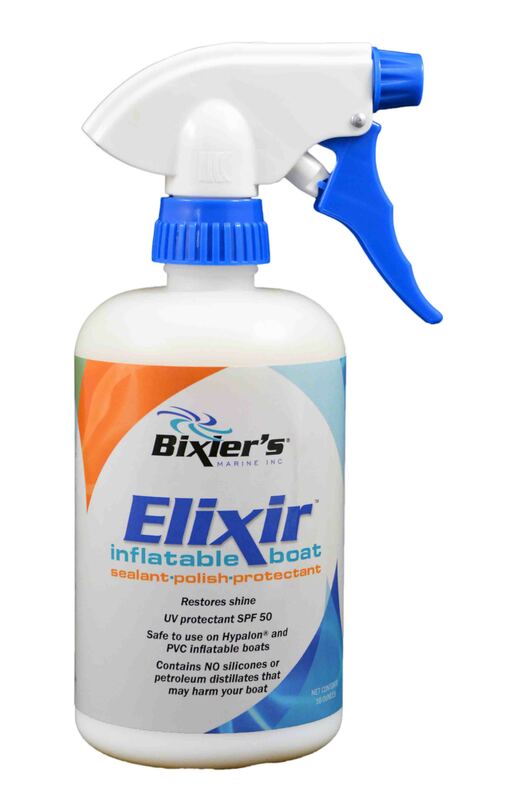 Bixler's Inflatable Boat Cleaner is a superior cleaner for all inflatable boat fabrics and surfaces, including fiberglass. Buy 2 or more and save $1.00 each. Orange Off Fiberglass & Plastic Hull Boat Cleaner, Ablative Bottom Paint and Barnacle Remover with 6" x 9" scrubbing pad. Watch dirt, mildew and oxidation melt away! Orange Off Inflatable Boat Cleaner, Removes Adhesives, Bottom Paint and Barnacles.Comes with crubbing pad, quart. 303 Aerospace Protectant "SPF 40 SUNSCREEN" for your Inflatable boat available in quart size. 303 Aerospace Protectant "SPF 40 SUNSCREEN" for your Inflatable boat available in 16oz trigger spray.